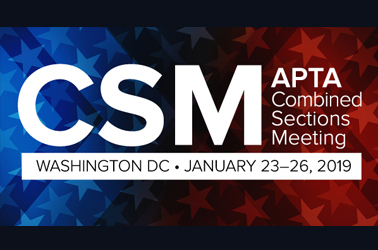 Amplify your learning in 2019 by attending APTA’s Combined Sections Meeting (CSM). Join the largest gathering of physical therapists, physical therapist assistants, and physical therapy students in the country. CSM 2019 will take place January 23-26, 2019, in downtown Washington, DC at the Walter E. Washington Convention Center. Connect with over 12,000 other dedicated physical therapy professionals. Engage with industry leaders from every section and specialty while you explore over 250 networking events! Explore over 450 exhibiting companies showcasing more than 1,000 products. Earn up to 18 CE hours through the 300+ educational sessions offered. Learn hands-on during one of 50+ preconference programs. Experience the world-class monuments and museums our nation's capital has to offer— most are FREE! LEARN MORE ABOUT CSM AND REGISTER TODAY! Book your housing and travel by January 2nd to take advantage of special rates. Click here for housing/travel information. Click here to watch highlights from CSM 2018. Please be aware of this fake website: apta.2019conference.org. This is NOT APTA’s website and is in NO WAY AFFILIATED with APTA or the Combined Sections Meeting. We are warning our members against giving this website any information.